← French Baroque — It’s French to Me! Alleluia! Sing to the Lord! Last Christmas, I sang “Amarilli, Mia Bella” — my first aria and vocal repertoire piece in general — for some traditional Catholic family friends. After I was done, the impressed guests urged me to sing at the Latin Mass at my parish. I was enthralled with the idea; however, I did not officially make the move to join the schola until this August, when I began attending Latin Mass and was approached by many people to do so when they had heard I was a trained vocalist. So, I left my number with the chaplain, who then put me in touch with the schola director, and — the rest is history! 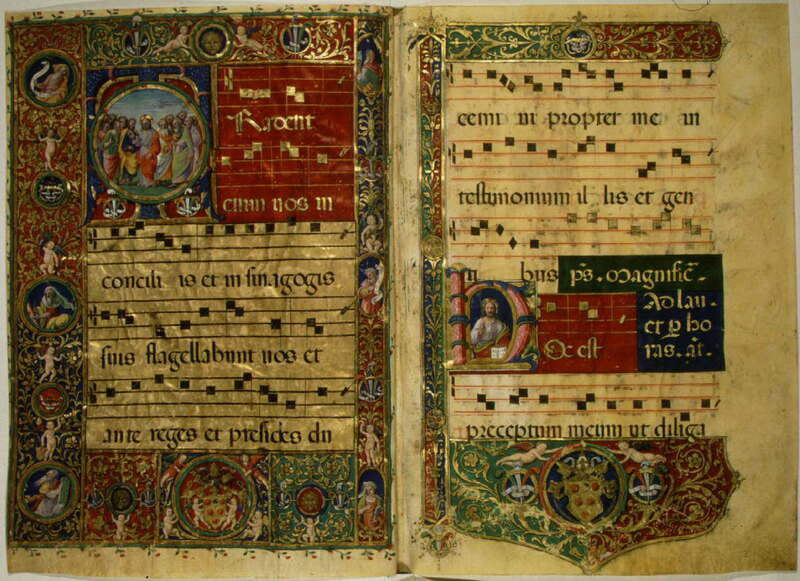 Little did I realize that joining the schola would not only endow me with the opportunity to use my musical gifts for God’s glory, but it would also expand my early music palette into the wonderful worlds of Gregorian chant and Renaissance polyphony — both essential portions of early music. In particular, the chant fills my soul, inducing the deep, gentle breathing that quiets and uplifts me, soothing me into a meditative state of peace. No doubt the neums and foreign notation initially confused me, yet with one-on-one help from my schola director, I am rapidly progressing in my ability to read the notation. Right now, I have been successfully singing chants on my own, intoning for the choir at times, and even learning how to conduct chant based on historical documentation. In my one-on-one chant study sessions with my schola director (who was trained by monks and has attended countless chant workshops), I have not only deepened my relationship with God and appreciation for sacred music, but I have also deepened my appreciation for HIPP and the origins of Baroque music (and all classical music) in general. As I learn the principles of chant and its notation, I frequently notice parallels between Baroque musicological concepts and chant principles. For example, the counting system in chant — which is divided into groups of two and/or three depending on the prolonged neums — parallels the hemiola; in fact, when I mentioned this to my schola director, she nodded in agreement and continued on that chant is “one big hemiola.” The free-flowing rhythm of chant also reminds me heavily of the inegal and non-stagnant performances of Baroque by HIPP artists; the whole goal is not to make it stagnant as many mainstream chant recordings make it, but to let it flow, watching the hemiola-like rhythm. Most importantly, I have noticed that the structure of chant highly parallels the individual text of the chant inasmuch as Baroque music’s rhetorical structure parallels the text or prevailing affect of a piece. In reading Tarling’s book on rhetoric which I reviewed in one of my earliest posts on this blog, I was highly fascinated with how the Baroque masters’ practice of paralleling specific structures with specific emotions (e.g. chromatics often signaling pain), and looking at the structure of individual chants alongside their corresponding texts, I see the same to be true. For example, in one chant that I recently sang, a passage regarding mountains was accompanied by ascending, high runs. Deducing from my observations and musicological readings, I have come to the conclusion that Gregorian chant is the mother of all classical music and a surefire way to accurately tackle HIPP regardless of performance era. I now have a deeper understanding of Baroque musicological principals and can more readily identify/interpret them in my HIPP-related activities. No doubt chant may seem archaic and confusing to many, yet those HIPP artists like myself who venture into its heavenly strains will undoubtedly emerge more confident and aware of the origins behind our secular HIPP-related work.